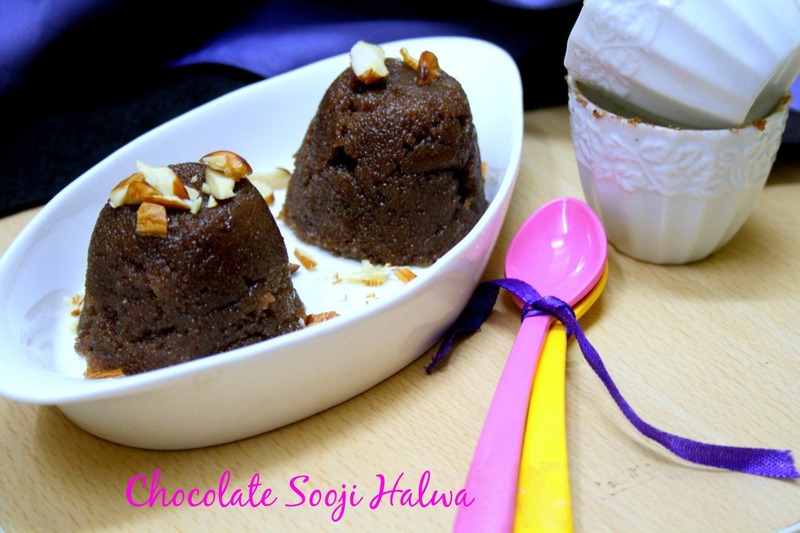 For the next recipe under Chocolates, I have another fusion dish made with Cocoa and Sooju Halwa, making it a sinful Chocolate Sooji Halwa. Maybe the south Indian in me, thinks anything made with Rava, sugar becomes a Kesari, so I would even call this a Chocolate Kesari Bath, even though I haven’t added any kesar to this, nor the typical Cardamom. When I think about it, as I hardly ever add vanilla essence to my bakes, I avoid cardamon most times. I do not know why, somehow I just avoid. I have no aversion to either Vanilla or Cardamon, mind you. Its just mental makeup. Just as I might want to add cocoa/chocolate to anything. I just had a small bite of this and Konda promised to enjoy and I even took for my colleagues. As I said I was thinking about what next to make, when this thought came up and I had cooked this already in mind couple of times. My chocolate compound stock is over and even though I had wanted to make it with chocolate, I had to resort to cocoa powder. Still I am so happy with the way this dessert ended up. Even though the cocoa flavour isn’t so strong in this, it has a mild touch and the looks was so impressive. I will surely settle for this anytime. I made this with just 1/4 cup of Rava and ended up using nearly 1 cup of water. To make it even more rich, you could add milk. However I feel this just fine. I am still yet to plan for my third day, though I have few ideas. Hoping I will get some spark and get the work done soon. Heat a non stick pan with ghee, roast the chopped almonds, remove and keep aside. Then roast the rava in 2 tsp ghee till it changes colour. Remove and keep aside. In the same pan, bring 1/2 cup of water to boil. Heat the remaining water and keep it aside. When the water starts boiling, simmer and add the rava to blend well. Cover with lid to cook the rava. 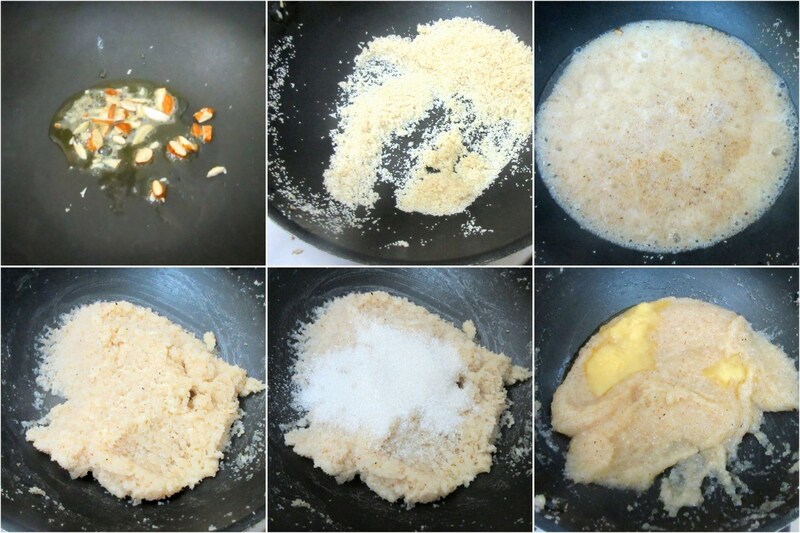 When the rava is getting cooked, keep adding ghee slowly and mix well. Now add the sugar and mix well till the sugar gets melted. Cover and simmer for few mins. When the whole mix is nicely done, add the cocoa powder and combine everything together. Finally add the remaining ghee and roasted nuts. Serve hot. 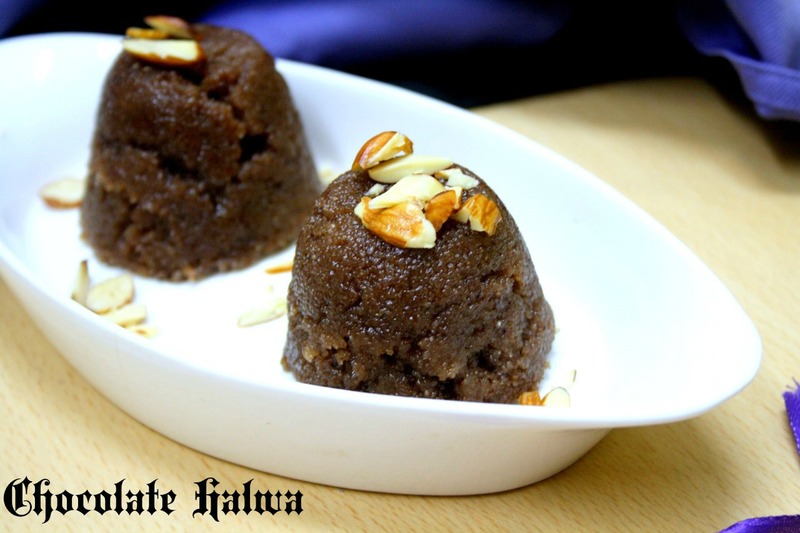 Very hard to resist to this alluring halwa, just cant take my eyes from your pics. Nice presentation. Halwa looks like a baked goodie, a cupcake. I went back to read the recipe again to check if I missed reading the baking step. Awesome idea Valli. Looks so divine..
Another interesting twist to an Indian dessert. 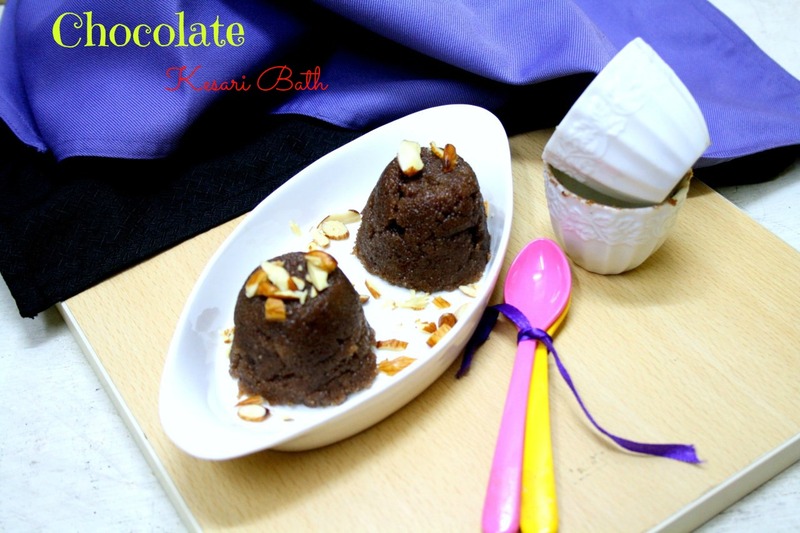 Chocolate kesari sounds amazing. Chocolate in suzi halwa,I would have never imagined that.Looks too tempting.